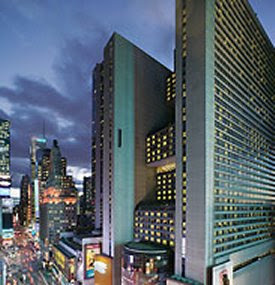 AllThingsDigitalMarketing Blog: OMMA Global New York, September 26 – 27, 2011: You should have been there! OMMA Global New York, September 26 – 27, 2011: You should have been there! On Monday, September 26th, advertisers, agency, online media, and marketing executives gathered at the Marriott Marquis Hotel in New York City for the Bi-Annual OMMA Global Conference. The event proved to be one of the most exciting conferences and provocatively focused on all things digital marketing, media and advertising. Known by many as being the only, “two-day intensive that combines all of OMMA's single online marketing conferences into one,” the event included extensive overviews and presentations of the hottest trends and technologies in Social Media, Mobile, Display, Direct and Video for the Internet. The Global General Sessions during Monday afternoon were top notch and provided innovative approaches and perspectives of our ever-evolving, hyper-connectivity, web-centric, world. Digital marketing is indeed changing the way it interacts with consumers. Dermott McCormack, EVP Digital Media, MTV Networks, spoke about "The New Rules of Digital Content Currency" and the importance of becoming a trusted source of information by building on knowledge of your audience, content curation, the re-purposing of content for new mediums and the idea of wrapping your content in "value"
The web has a huge effect on advertising and marketing. Next up was Denise Warren, Senior VP and Chief Advertising Officer of the NY Times Media Group. Her talk opened with a description of how TIVO changed the TV landscape forever, giving viewers the power to program TV to their liking. Ms Warren then went on to illustrate how this customer/consumer now drives the innovation at the NY TIMES. They analyze their customer relationships and tailor their offerings to them relatively. A very interesting point Warren brought up was that the "after hours" usage seemed to be increasing with desktops and laptops being used in the daytime while tablets and smart phones, etc., seemed to be increasing in the evening. Warren also spoke about "interstitial moments." An interstitial space or interstice is an empty space or gap between spaces full of structure or matter- think commute time, standing in line, waiting for the doctor, etc. These "in-between" times are being used by consumers and customers to consult tablets and smart phones. To tackle the effects the web will have on advertising, marketing, consumer targeting and reach, the Tuesday afternoon presentation included a debate on Social Media sponsored by Webtrends titled, “Is Social Media ROI for Real, or is it a New Oxymoron?" Topics included a lively debate on the rising importance of Facebook or not, the importance of drilling down into other social networks where your customers might be hanging out and the question "Do 'Likes' translate into Sales?" Participants included Jonathan Bellinger, Digital Strategy Director, JWT, New York; Brandon Evans, CEO, Crowdtap; Mike Germand, President, Carrot Creative; Morgan Simonson, SVP of North American Sales, Efficient Frontier; Michael Lazerzon, CEO, Buddy Media. Round and round the web goes, where she stops, no one knows. So who do you think will dominate the webosphere? There are quite a few contenders -- Apple, Facebook, Google Android, Microsoft Mobile, and Twitter. I enjoyed the 2 day conference. I was especially interested in the implications of social media and the new habits and modes of interaction people are starting to use. I came away with some new insights. Thanks for commenting! I really hope the tips help other young girls! !